You can order yourself one unpainted (for $159 US) or fully painted ($230 US). Be sure to let us know what you think of this kit in the comments! We're quite impressed! 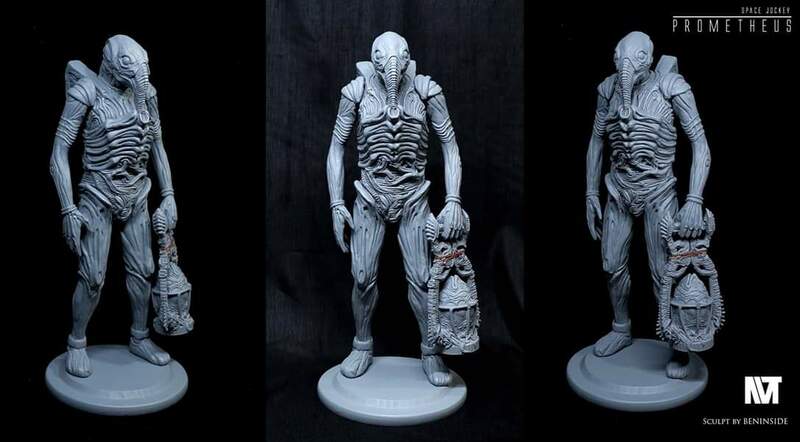 10 Fan responses to Check out this awesome Prometheus Space Jockey resin kit! 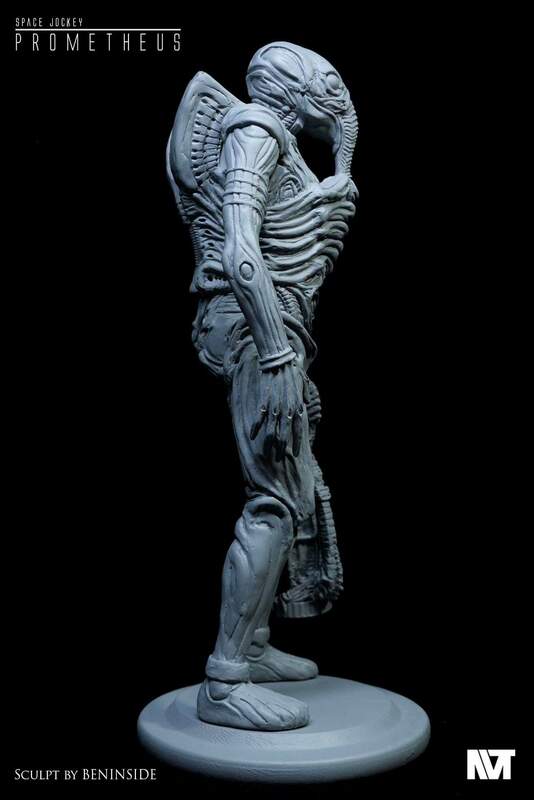 "which embodies the Prometheus Space Jockey as us fans originally envisioned them. "How are this guys different than the suits from the "Ghosts" in Prom, or the suits in Covenant? 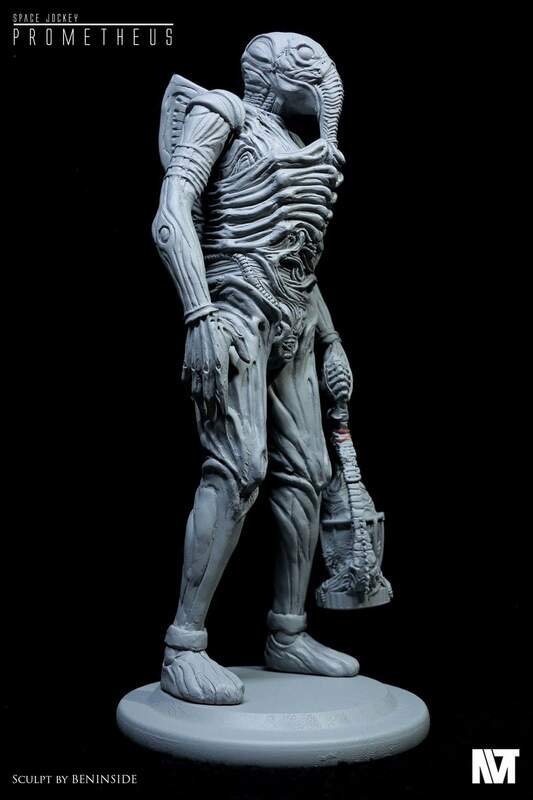 The figure looks great and If I would buy it, it would be the in kit form to customize it, as the egg basket is stupid. No cover for the egg opening. And there were no eggs before covenant. The flute/recorder I think would have bee better. There might be both funny and/or profound Easter jokes here. I will go with funny. It looks like an Easter basket with an egg the Engineer never had. The Engineer feet look kind of strange too when looking at the hands. Yeah, it might be fussy, but for $200, I would expect more. 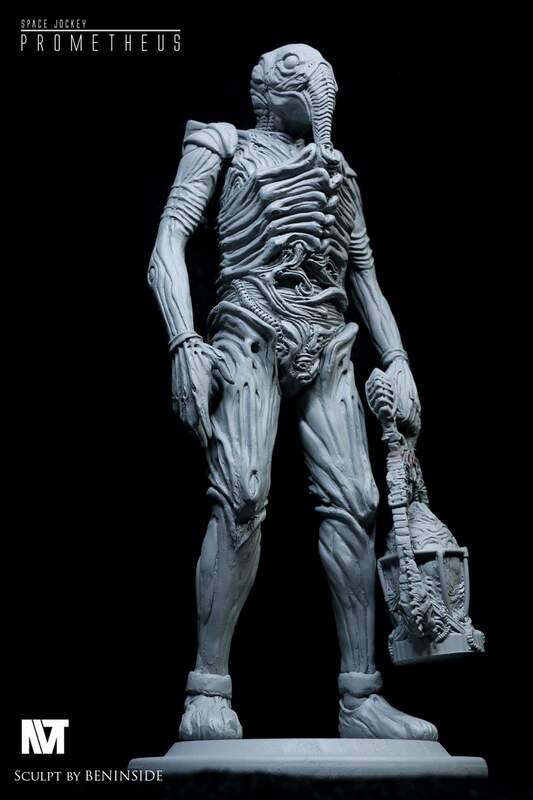 Regarding "some fans still consider the original Jockey as a separate entity" i can see some still think its NOT a Space Suit but if they check out the HR Giger Concepts then its NOT-ONLY a Space Suit but its occupants are Bald Humanoids. 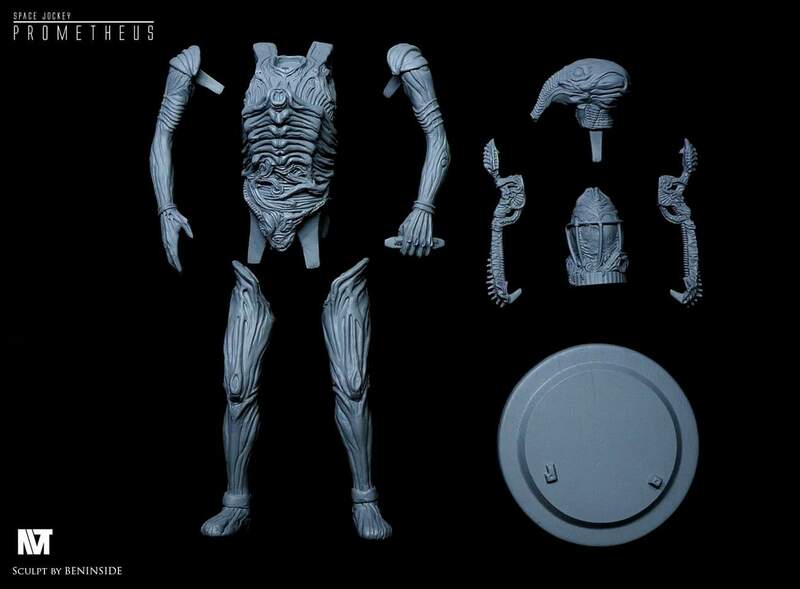 The Model Proportions seem to be closer to the Space Jockey apart from the Broadness of the Chest Area... i have edited the image to create one thats more closer to the Space Jockey and also HOW SMALL the Prometheus Space Jockey was in comparison. The foot is more articulated here. Indeed the Pressure/Bio Suit seems to allow more Articulation, but the Space Jockey Suits seem to limit that due to the BOOTS. Speaking of Easter jokes, how about combining the Engineer with the Easter bunny so you get an Engineer with long ears and big teeth? As far as the SJ goes I still think that it is a bald humanoid kind of thing in a space suit. This is the explanation that makes the most sense to me. I have never understood the thing as just being a space suit, that makes it look like a suit that is programmed as a robot that walks. Having it as a suit with a bald humanoid life-form makes the most sense to me. Thoughts_Dreams combining the Engineer with the Easter bunny so you get an Engineer with long ears and big teeth? 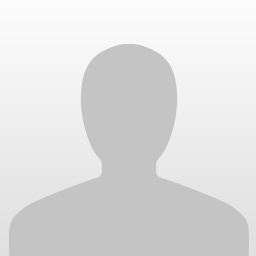 I actually brought the same idea up to a forum member who has the chops to pull it off but the individual is afraid of fanboy wrath and probably will not do it. What are you talking about? The basket is good. Or what do you think an engineer can transport one egg? Ahaha! I do not laugh at him but the fact that some might be so easily offended is amusing, and sad at the same time. 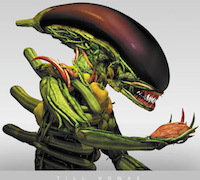 Don’t you think that some of those that were involved with making the franchise (prop-makers, producers, and so on) might have had ridiculous thoughts about some of the alien things some time? My point is that you can not be so extremely serious about a franchise so you can not make fun of it. Hell, look at Star Wars and the parodies and memes that it creates, it is hilarious sometimes. 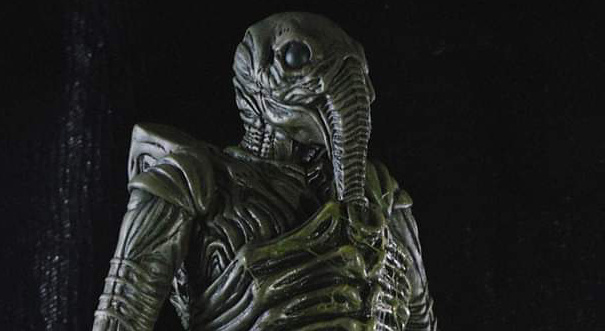 The Engineer helmet design always reminds me of the Selenites from the Nathan Juran directed First Men on the Moon, rather than Giger's Ganesha-like pilot. This figures helmet design even more so!